As Leo Tolstoy aptly put it in his famous Anna Karenina, “I think... if it is true that there are as many minds as there are heads, then there are as many kinds of love as there are hearts”. Tolstoy was right, there are so many different kinds of love – whether it’s romantic love, platonic love, or lust. Love can take the form of a friend cooking food for a loved one in the hospital, or a mother looking at her infant child for the first time, or a child sharing their last piece of candy with their best friend. Most people consider love to be “adult” emotion and therefore may not prioritize teaching children about it. However, Dr. Richard Weissbourd from the Harvard Graduate School of Education encourages us to look at love through a different lens when it comes to children; he thinks self-maturity, respect, and deep appreciation are important aspects of love to focus on when cultivating this virtue in children. Teaching children how to cultivate and practice self-love from an early age may be key to raising adolescents and individuals who can then appreciate and love others well. Many studies in psychology focus on two concepts based in mindfulness practices: loving-kindness meditation (LKM) and compassion meditation (CM). The practices are used to enhance unconditional, positive emotional states of kindness and compassion. In one such study, participants were randomly assigned to either the LKM condition or an imagery condition. In the LKM condition, people were instructed to imagine two loved ones standing on either side of them and sending their love. Then, they were told to open their eyes and redirect these feelings toward the photograph of a complete stranger. In the imagery condition, participants did almost the same thing except they imagined two acquaintances standing next to them. They found that Loving Kindness Meditation had a significantly greater effect on explicit and implicit positivity toward strangers. Implicit positivity was measured by response time to a particularly emotionally-charged word.Implicit positivity means that though a person might not be able to express that something has changed, a change in their behavior (like response time) tells us that something has indeed changed within them. They also found that LKM was associated with greater implicit positivity towards the self as well. This study found that a short exercise of loving-kindness meditation could lead to big changes in how people thought of others and themselves. Another study investigated if Loving Kindness Meditation could help enhance daily experiences of positive emotions. Researchers conducted 60-minute LKM sessions over the course of 7 weeks and found that this specific type of meditation led to shifts in people’s daily experiences of a wide range of positive emotions including love, joy, contentment, gratitude, pride, hope, interest, amusement, and awe. Even more impressive, these emotional shifts lasted for a number of weeks after the course ended. Dr. Weissbourd believes that for children and adolescents in particular, love is an important virtue to cultivate intentionally because society tends to focus heavily on preparing young adults for work, but not love. If children were taught to love themselves and others the way they’re taught to work hard, maybe intimate relationships with partners, family, and friends in young adulthood and beyond would prove to be easier, healthier, and more successful. Creating content that can help children cultivate positive, loving emotions toward the self and others is therefore an essential skill that shouldn’t be shoved off until adulthood. Love, in all of its forms, will be present all throughout life. Therefore, it is crucial that the media children consume teach them about love by depicting healthy relationships with others ways to love and care for themselves. Dr. Weissbourd recommends showing children positive representations of healthy relationships. Create apps that promotes engagement of Loving Kindness Meditation for 5 minutes every day – think of a loving moment in your life, focus on the emotion of that loving feeling, try to project these feelings onto others you visualize. Cultivate self-love by encouraging writing what you like about yourself! Create media that demonstrates characters exercising self-love and self-care practices. Julia Schorn is a second-year Ph.D student in Psychology at UCLA, with a focus in cognitive neuroscience and memory. In her free time she enjoys playing the harp and making science accessible to everyone! Many have asked: What is love? A question that is all-too-common, all-too-asked, all-too-experienced- and yet perpetually misunderstood. We may flip open Romeo and Juliet and pine through Shakespearean sonnets. With our own hands, we may take to novels, poems, essays. We may describe love with all possible adjectives in all possible languages or sing songs that produce countless romantic melodies. Can science and technology tell us anything about love? Clearly, love is not an on-off switch that we can control at our fingertips with our smart devices. It is a human emotion, one that is impossible to explain and attribute to non-human devices. And yet, an entire sub-branch of artificial intelligence, known as artificial emotional intelligence, aims to do just this. Well, in actuality, it is much more complicated. But, the idea is very simple at its core. Think about Alexa. After a long day of work, Alexa seems to be a great option to empty workday frustrations on. Yet, her unflinching calmness and apparent lack of emotion to our range of emotions can be highly frustrating. How emotionally “dumb” are our intelligent assistants? To answer this question, researchers at the Massachusetts Institute of Technology (MIT) media lab are training digital assistants to accurately read and respond to human emotions. In fact, Affectiva, a company started by a group of MIT media lab researchers, has already developed emotion recognition software to track user’s emotional facial expressions (face-tracking) and physiological responses. 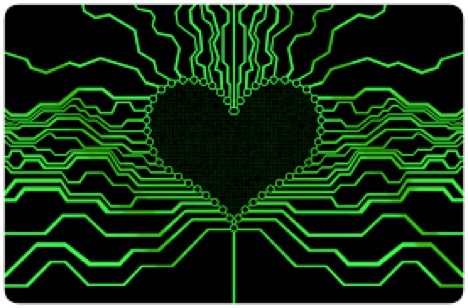 What implications could artificial emotionally intelligent devices have for love? Creating devices that accurately recognize and respond to human emotions can provide support and love to individuals with clinical impairments, such as in autism and schizophrenia. Even in the general population, artificial emotionally intelligent devices can provide company to isolated individuals, or those who miss the experience or connection of love. Physically, individuals who are confined to wheelchairs or whom do not have the luxury of moving out and about, can have a more tangible device that can provide a proxy for human companionship. One of the major criticisms of modern technology is the apparent lack of empathy. We live in a society that is largely producing human avatars devoid of emotion and love. Modern day dating apps such as Tinder, for example, have faced heavy criticism is its marked disinterest in the value of love, and heightened fixation on “hook-up” culture. How can we utilize technology to promote love in all its forms? One of the first goals should be to use technology to promote love in our society. Prior to our social media world, Temple Grandin created the early “hug box”, which provided social stimulation to adolescents with Autism Spectrum Disorder by allowing them to hug a machine for sensory relief. Previous studies found that in autistic children, there was an overall reduction in tension and anxiety when using the hug box, demonstrating profound improvements in social impairments. In the current age, modern AI researchers have sought to down-size the “hug” box and instead, utilize some of our smart devices to ameliorate some of the social deficits in Autism. Additional work from Affectiva has focused on emotion recognition in Autism through utilizing affective computing. This artificial emotional intelligence has also been applied to other clinical impairments such as depression. The rise of social media has related to increased amounts of depression (particularly in adolescents and teenagers). Recent research has even found that limiting social media use to around 30 minutes per day can lead to significant improvements in overall mental health. As a result, automated assistants that can monitor overall emotional and physical health have now been implemented in biometric algorithms to bridge the gap between healthy mental health and depression. Spreading positivity and love in society is very important. In an age where a majority of social interactions occur online, it is important to experience and connect with love. Yet, a previous study in the UK of more than 10,000 people found that of people between aged 12 to 20, 70% of respondents admitted to being abusive online. These surprising statistics speak to the human faces (many of them teenagers) who have lost their lives at young ages to suicide due to cyberbullying. While technology can reduce love and positivity, Trisha Prabhu, teenager and founder of ReThink, sought to utilize “technology” to solve “technology’s” existing problems. She implemented a simple technology that can detect an offensive message and subsequently provide the user an opportunity to “rethink” their post. Previous research conducted by ReThink has shown that when adolescents are asked to re-think their decision, they end up changing their mind 93% of the time. This simple “check” to stop online harassment in order to spread positivity can seamlessly bridge modern technology and human emotions. From sharing positive content on YouTube, to re-tweeting heartwarming posts, who says that we cannot utilize technology to spread positivity? We may not yet have access to complex artificially emotional intelligent devices, but it does not mean that we cannot spread love. All it takes is a spin on Trisha’s rethink of negative online comments by thinking more about “love,” even if it is simply a heart on the next Facebook update we come upon. Akila Kadambi is a third-year Cognitive Psychology PhD student at the University of California, Los Angeles where her research focuses on the intersection between higher-level social cognition and biological motion.